Alan King's rapidly progressive staying handicap chaser Hold On Julio heads the ante-post market for the SkyBet Chase at Doncaster on January 28 despite having been handed an 11lb rise in the weights following his latest impressive win at Sandown, writes Elliot Slater. The nine-year-old has raced only five times under rules, (two of those outings were when starting at three-figure odds for a couple of Scottish novice hurdle races in the 2008/9 season) when trained by Vicky Simpson, who went on to do well with the gelded son of Blueprint between the flags in northern point-to-points. He joined King's high quality yard in October of 2011 having been purchased for 28,000 guineas at the Doncaster Sales a few months earlier after winning a Kelso maiden hunter chase by 28-lengths on his first outing under rules over fences. Those looking at the horse racing odds markets need to remember this. Given a handicap rating of 117, Hold On Julio made his debut for King at Sandown on November 5 and clearly had been showing something at home in being sent off the 7/4 favourite for a competitive handicap chase, a race he turned into a procession in eventually beating Earth Planet by 11-lengths. Raised 16lbs to a mark of 133 the exciting prospect then returned to Sandown on January 7 where under a fine ride from Wayne Hutchinson he recovered from a couple of sloppy leaps in the first half of the contest to come charging home up the Esher hill to beat the smart Neptune Collonges by nine-lengths, catapulting himself into the forefront of the market for the SkyBet Chase, a race for which he is now generally on offer as the 5/1 favourite. 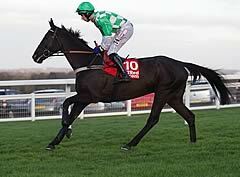 It is hard to tell just how much improvement there is left in King's lightly-raced performer, but given the normally decent ground on Town Moor that suits him well there is every chance that Hold On Julio will run a massive race once again despite shooting up the handicap.